Submit a photo of your original, microbe- and agar-based art for the chance to win up to $485′ worth of prizes. 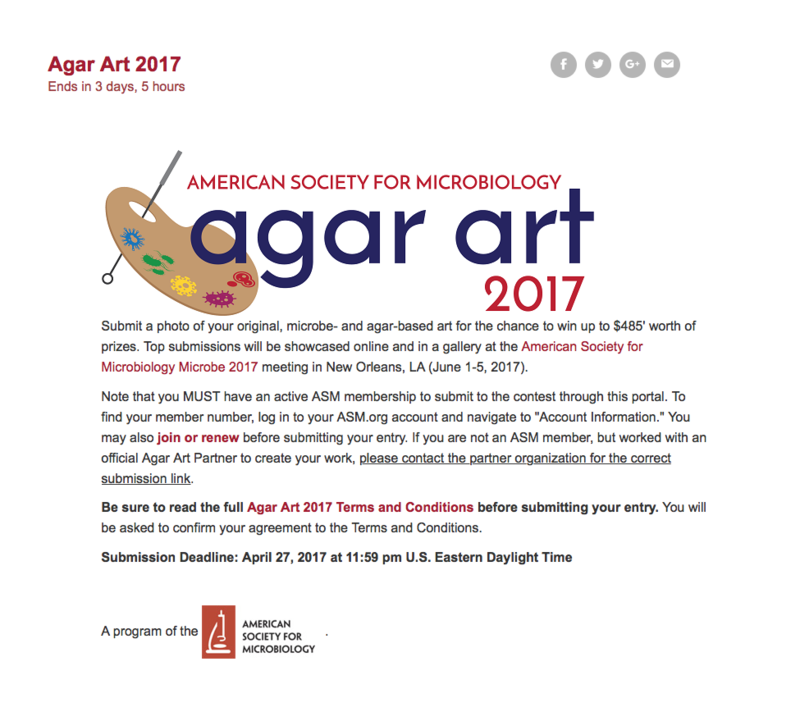 Top submissions will be showcased online and in a gallery at the American Society for Microbiology Microbe 2017 meeting in New Orleans, LA (June 1-5, 2017). Note that you MUST have an active ASM membership to submit to the contest through this portal. To find your member number, log in to your ASM.org account and navigate to “Account Information.” You may also join or renew before submitting your entry. If you are not an ASM member, but worked with an official Agar Art Partner to create your work, please contact the partner organization for the correct submission link. Be sure to read the full Agar Art 2017 Terms and Conditions before submitting your entry. You will be asked to confirm your agreement to the Terms and Conditions.